There is only Myanmar jadeite jade left which is mainly exported to China. Additionally are semi-precious stones from Myanmar and Madagascar. The usual classification is the division into precious stones and semi-precious stones which is first the corundum family consisting of Ruby and the sapphire mineral. Plus here is a list of so-called semi-precious stones. 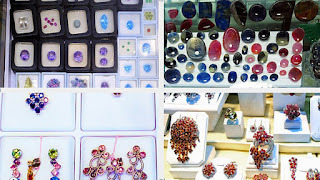 About precious stones colors and varieties.. Most semi-precious stones are of an inorganic material with a particular chemical composition and an internal crystal structure. A few of them such as pearls and amber are from plants and animals origin they are known as organic gems. Other gemstones such as Lapiz Lazuli & Turquoise azurite plus copper-rich stones blend with water. Malachite, emeralds and tourmaline are made when water get in touch with magma and then crystallize. Spaces are broken up, are filled with veins of other minerals and form hydro-thermal deposits. In the last hundred years artificial stones (also known as fakes or syntetics) were created in labs which this materials are physically the same as the natural ones, often even better because no inclusions so much clearer but people like it made by mother nature. Normally all minerals are originated from natural processes without any direct activity or interference of man. With modern technology today physical and chemical properties similar to mineral are made but because it is man-made it cannot be called natural. Certain minerals always occur in specific associations and experienced geologists and collectors know what minerals to expect in a particular geological formation and what minerals will be missing. Gemstones, since earliest times they have captivated mankind and their story is the story of the man himself. This fascination with gems is evidenced by the large body of literature that has grown up around them. The business in Burmese gemstones for sale really started to get momentum with the discovery of the country by European explorers around the 15th Century driven by Portuguese and English adventurers. 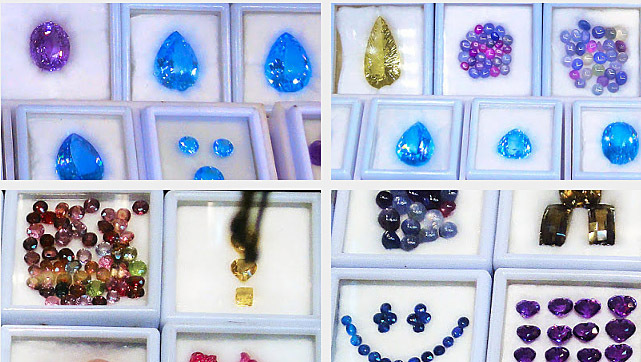 Here are some sapphire, quartz, topaz and tourmaline on display in Yangon's Bogyoke Market. There are plenty of other such as rubies, amber, jade, pearls plus locally mined diamonds, gold, and silver. The country is very rich in minerals and metals and most Burmese jade jewelry supplier is in this bazaar. When buying precious stones in Myanmar the Bogyoke market is the first address but for sure not the cheapest one. Bangkok and Chanthaburi in Thailand are having better prices since the market volume turnover is much higher but also the risk to get cheated is much higher and not heat treated gems, especially such as ruby and sapphire are almost not available in "in the country of smile". It is necessary to change a reasonable amount to the local currency because naturally, they use Kyat and if you want to change anywhere except at Yangon the exchange rate is not good at all. Since the Kyat has almost no value a couple of kilos quickly come together when the prices for the desired gems are high. Since 2015 credit cards / debit cards are working again quite ok that could be an alternative, but Yangon is the only place there this really works and if you want to change somewhere up country (also the airport) the exchange rates are not good at all. In recent times plenty of "shoppers" fly in from neighboring countries on the quest for a good deal but frankly, most things are more expensive in Myanmar compared to the countries around even when they originally come from Burma. This is particularly true with prices for corundum stones such as rubies and sapphires which are cheaper in Thailand because the market for them is much larger, on the other hand, the risk to be cheated there is much higher. A Blue sapphire from Myanmar has the highest quality. The name sapphire means >blue< in Greek language and until the 1800 Century people meant Lapislazuli. Only after that time people, started to understand the different properties and the classification as a precious stone of the corundum family was made. The red varieties are rubies, all other are defined by the color and there are plenty. They are similar to other corundum minerals such as rubies only the color is different. Most of them are smuggled to Thailand and sold in Bangkok and Chanthaburi south of Pattaya. 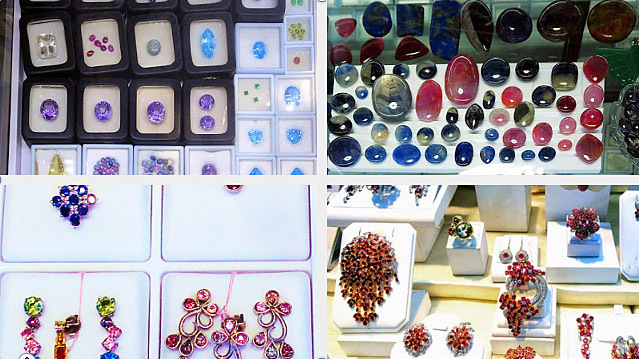 The city is an important trading center for colored gemstones mainly from Burma. There they are mined in the same area as rubies in Mogok north of Mandalay. Star Sapphire are spectacular Myanmar gem with an amazing effect sought after as rings and loose stones. Pink corundum (sapphire) is the next best to a "pink diamond" for a much lower price and look the same. + Hardness according to Moh Scale is: 9. + Made from Aluminum Oxid AL203. Trace elements make the colors, there is a process known as intervalence charge transfer which comes from impurities of titanium and iron in a blue sapphire make. It was a mystery for very long time where the magnificent blue color comes. The discovery was made by Auguste Verneuil who created the synthetic ruby and used modern technique to find that out. It was the presence of titanium and iron together in corundum which make the color. Many sapphires possess the necessary impurities for a deep-blue hue but in the wrong physical state thus they have almost no hue at all. The suitable heat treatment can transform the colorless gem into a beautiful blue one. E.g. pale gemstones are heated to between 1500 and 1900 centigrade where the heat melts the rutile, driving the titanium into a solid solution, while the changed atmosphere converts the iron present from a ferric to the ferrous state. Cooling the stone rapidly prevents the titanium resolving back into rutile. Now both elements which are needed for are present which the result that the cloudy pale-colored stone becomes clear with a deep-blue color. Sapphires are probably the most famous in this color spectrum. Although there are a couple of other such as diamonds, lapis lazuli, tanzanite, tourmaline, turquoise, blue spinel and more. Blue sapphire are beautiful precious stones with a wide color spectrum from the blue of a fresh cornflower to the very deep mysterious intense deep ocean. They also come with other colors such as pink, yellow, white. A pink sapphire could be a very good alternative to a "pink diamond" since they look very similar and the price is much lower read more. Myanmar (Burma) is one of the major sources of high-quality stones in the past but now other producers are taking over in particular Madagascar and Tanzania but the quality can't match Myanmar sapphire quality. With the help of companies from Thailand which usually used Burmese stones but because of the political situation there in the past no foreign companies were investing anything into new production facilities for mining and the supply dries up slowly. They are next to diamond in hardness and therefore resistant to wear. Australia is the largest producer of blue and golden stones. The largest stone known was a 950 carats gem from Myanmar - Burma. The largest in Australia was 886 carats from Queensland in 1934. There are star sapphires and star rubies found which contain fine fiber crystals giving the star effect when cut as a cabochon. This gem is something special, mined in the Mogok and Mong Hsu area in Myanmar but the real dealing is going on in Chanthaburi and Bangkok, Thailand. Actually, it is a common problem with all these precious stones including star sapphires, they are found somewhere when they are moved out of the production country not much value is raised. After the stones left the country lets to say for Thailand, India, Europe or Israel the prices made a jump upwards and people in those countries make the real profit by cutting and polishing them. It has been a common belief that this blue stone bring magic, charm and good luck to anyone who gets a hold of them. Pictures of a stone go with blue flower, blue water, and blue sky. They depict blue color somehow since the gemstone is effectively corundum, yellow, violet, purple, pink and orange colors are also within the spectrum. Sapphire jewelry photos show the whole beauty of this precious stone if the cut is excellent and maybe a few diamonds added it become the perfect blue piece of jewelry. They come in many colors almost like orchids, depending on the impurities such as titanium, chromium, iron and other, all can change the color of the mineral into colors such as green, pink, orange, yellow and various shades of blue plus black and gray, more. became very popular during the middles ages and were the rings of the clergy. Their strange belief was this precious stone is representing heaven and jewelry is still going strong until today. Since we live in a modern world synthetic stones (and not only blue). Because of the advancement in the production of synthetic stones today they are available for very low prizes relative to the natural gems. Like a beautiful piece of jewelry on your finger? Sapphire Rings are already very old body decoration. They come in various forms, shapes, with our without a stone, with several stones or whatever, the limit is only the fantasy, creativity and the budget.Many possibilities are here, there are diamond rings, various other types of precious stones and maybe set on a white gold, yellow gold or a platinum frame. The stones are paired with are ruby, emeralds, jade, diamonds and plenty other, one of those are sapphire rings. That could be a blue, yellow, pink, white or any other sapphire color, there is a broad spectrum, they call that fancy colors. There is a star among sapphires and rubies, which are actually physically similar but got a different inclusion during forming. Means be careful when purchasing any precious stones since there is all kind of fake stones out there, some are heat treated, often done with rubies, others are synthetic and others are injected with chemicals, this is often used with jade items to give them a translucent green color. Blue sapphires were already mentioned in the Bible and some old Greek texts and some people in India are wearing a blue sapphire to protect them from evil spirits. A pink sapphire is often used instead of a diamond with the same color, they practically look the same and it is not possible to see a difference without technical tools. These similarities lifted the demand for pink sapphire and the prices also moved up after some celebrities were spotted with rings having that colors. There are some similarities to the market and demand for yellow, also they are usually more saturated than yellow diamonds they look very similar. In any case, it needs to be careful because the heat treatment is often used to melt out impurities. The pink hue comes from aluminum oxide and some chromium in the crystals. Some inferior pink stones get heat treatment for a better deeper pink color. Most pink gems came from Myanmar or Burma and Sri Lanka until some decades ago, today this has changed, the main producer now is Madagascar, Brazil. and Australia. Big deposits have been found there in the early 90 ties of the last century. Myanmar lost a big piece of the market in recent years since there is no major investment in the mines. The mines still work in the same way as always done since ancient times. After being able to cut and polish this hard material forms were created and maybe one of the first precious stones used were sapphire and rubies. The Babylonians, Sumer, and people of Egypt plus Mayas, Incas, Olmecs, and others gradually managed to produce more and more sophisticated rings, this were jade rings and others with an integrated stone. Madagascar simple mining is done with thousands of children dig for sapphires, some of the workers are not even six years old some other are 14 years old working in a blue sapphire mine at Manombo in Madagascar every day since 2 years now. He sleeps outdoor and from six o’clock in the morning until early evening he pulls bags after bag up the deep hole his uncle dig up, twelve hours a day. For lunch he eat yams or cassava, but not every day, others have nothing to eat at all. On ropes, the mine children move down the hole to dig the sand, bring up the sand and gravel from which the sapphires are sifted. The better ones are cut and polished to make jewelry from such as engagement rings mostly paired with diamonds. The stones are available in many colors not only blue, current sapphire fashion is pink and white but they also have yellow, light red and transparent. Since the colors are not much reflective no matter how they are cut, many jewelers set the bluestone as a center piece and pair them with diamonds. When buying take them outside into daylight to check since most shops have special lamps which enhance the vibration of the colors and what you see is not what you get. Plus necklaces, earrings, bracelets, finger rings, bangles and more. They always place some diamonds around; they are used as They won’t come cheap but to give them as a gift it’s not every day, on the other hand, there are different qualities and cuttings which make a wide price spectrum. Especially loose cabochons are popular for collection and jewelry together with other stones and usually in a white gold setting; it just fits better since both are rather cool colors. The stone contrasts very nicely with the red of a ruby. If you like to get a pink diamond but not enough funds are available this is the perfect substitute because it looks and sparkle similar.